Most of us aren’t cardiologists, much less trained in the science of anatomy. So, it can be difficult to understand the difference between sudden cardiac arrest and a heart attack. However, if there’s one thing you should know regarding the two, it’s that they’re definitely not the same. Think of it like this. The heart is an organ that functions in two distinct ways: electrically—the electrical impulses that cause the heart to beat—and mechanically—its primary function of “plumbing”— pumping blood throughout the body. Cardiac arrest happens when there’s a malfunction in the heart’s electrical system. A heart attack occurs when there’s a malfunction in the heart’s plumbing. Let’s dig into this a little bit deeper. 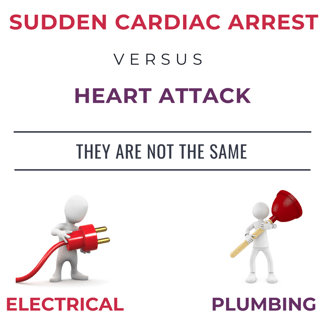 Sudden cardiac arrest (SCA), in its simplest definition, is a life-threatening emergency that occurs when the heart suddenly stops beating—the electrical system that powers the heart unexpectedly stops functioning. This electrical malfunction can happen to people of all ages who may seem to be healthy, even children and teens. It’s typically caused by a heart abnormality that a person is born with or develops as a person grows. The abnormality can often be hereditary. It can also be caused by a blow to the chest, drowning, trauma, electrocution, and other medical causes such as inflammation of the heart muscle due to infection. In contrast, a heart attack occurs when there’s a blockage in a coronary artery, which prevents blood flow to and from the working heart. This blockage is normally caused by a build-up of plaque in arterial walls. This plaque buildup puts much more strain on the heart as it tries to pump. And if the strain is too much, the result is a heart attack. People are typically conscious during a heart attack, and may experience chest, neck or left arm pain, shortness of breath, sweating or nausea. In extreme cases, a heart attack can cause the heart to stop, leading to sudden cardiac arrest. Heart attacks are most common in people over the age of 35. Sudden cardiac arrest, on the other hand, can strike without warning. However, symptoms may be present, such as fainting, palpitations, dizziness, chest pain, shortness of breath and extreme fatigue prior to collapse and loss of consciousness. The most important thing to remember is that SCA leads to death in minutes if the person does not get help right away. Survival depends on people nearby calling 911, starting CPR, and using an AED (if available) as soon as possible and until they can be transported to the hospital. Remember, their heart has stopped, so seconds can literally mean the difference between life and death. Intervention in the case of a heart attack requires a call to 911. CPR and the use of an AED are necessary if the person becomes unconscious while you wait for the medical team. Surgery is often needed to remove the blockage in the coronary artery and restore normal heart functioning. We hope this article helps you to understand the differences between these two similar, although very different, emergency situations. 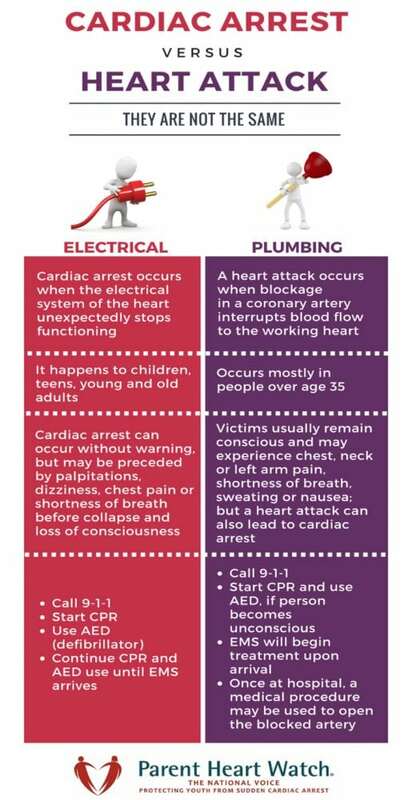 Please download and share our Sudden Cardiac Arrest vs. Heart Attack Infographic.